British folk-metal pioneers SKYCLAD are hard at work on their as-yet-untitled thirteenth studio album. 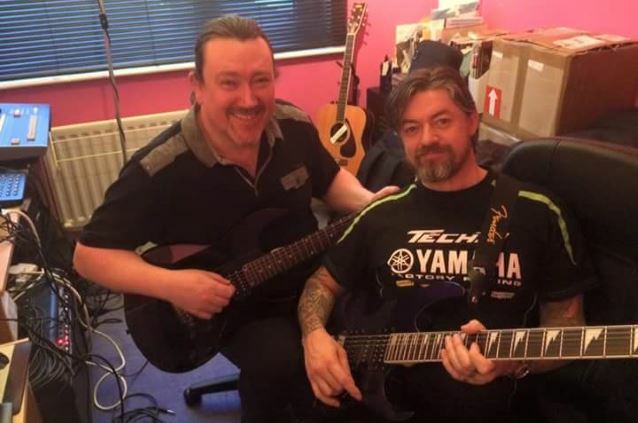 Following the return of guitarist Dave Pugh to the band's lineup as a permanent member in 2014, SKYCLAD played several major festival shows, including France's Hellfest and England's Bloodstock Open Air, before being forced to take a year-long break in 2015. This February, SKYCLAD got back together to work on the follow-up to 2009's "In The... All Together". The band comments: "We're really excited about having Dave back in the band. He's a fantastic guy, a great musician and songwriter! "The whole band is really inspired, and we're making good progress on the album. Most of the bits and pieces are there already. "Even though we played a couple of 'old school shows' recently, the new LP definitely won't be a thrash album; but it will be no typical folk metal album either. We'll use all the options we now have — with three guitarists, additional vocals, fiddle, keyboards, bass and drums — to create an album that will be the same but different. 100% SKYCLAD!" SKYCLAD hopes to release the new album within the next twelve months . The band's next live appearance will be at Germany's Dong Open Air in July. In other news, SKYCLAD's "A Bellyful Of Emptiness - The Very Best Of The Noise Years 1991-1995" will be released on May 27 as part of BMG's re-launch of the legendary German metal label Noise Records.